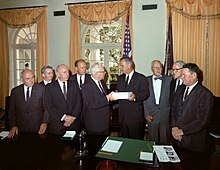 The President's Commission on the Assassination of President Kennedy, known unofficially as the Warren Commission, was established by President Lyndon B. Johnson through Executive Order 11130 on November 29, 1963 to investigate the assassination of United States President John F. Kennedy that had taken place on November 22, 1963. The U.S. Congress passed Senate Joint Resolution 137 authorizing the Presidential appointed Commission to report on the assassination of President John F. Kennedy, mandating the attendance and testimony of witnesses and the production of evidence. Its 888-page final report was presented to President Johnson on September 24, 1964 and made public three days later. It concluded that President Kennedy was assassinated by Lee Harvey Oswald and that Oswald acted entirely alone. It also concluded that Jack Ruby acted alone when he killed Oswald two days later. The Commission's findings have proven controversial and have been both challenged and supported by later studies. Nicholas Katzenbach has been named as providing advice after the assassination of John F. Kennedy that led to the creation of the Warren Commission. On November 28 he sent a memo to Johnson's White House aide Bill Moyers recommending the formation of a Presidential Commission to investigate the assassination. To combat speculation of a conspiracy, Katzenbach said that the results of the FBI's investigation should be made public. He wrote, in part: "The public must be satisfied that Oswald was the assassin; that he did not have confederates who are still at large". Four days after Katzenbach's memo, Johnson appointed some of the nation's most prominent figures, including the Chief Justice of the United States, to the Commission. The Warren Commission met formally for the first time on December 5, 1963 on the second floor of the National Archives Building in Washington, D.C. The Commission conducted its business primarily in closed sessions, but these were not secret sessions. Two misconceptions about the Warren Commission hearing need to be clarified...hearings were closed to the public unless the witness appearing before the Commission requested an open hearing. No witness except one...requested an open hearing... Second, although the hearings (except one) were conducted in private, they were not secret. In a secret hearing, the witness is instructed not to disclose his testimony to any third party, and the hearing testimony is not published for public consumption. The witnesses who appeared before the Commission were free to repeat what they said to anyone they pleased, and all of their testimony was subsequently published in the first fifteen volumes put out by the Warren Commission. In response to Jack Ruby's shooting of Lee Harvey Oswald, the Warren Commission declared that the news media must share responsibility with the Dallas police department for "the breakdown of law enforcement" that led to Oswald's death. In addition to the police department's "inadequacy of coordination," the Warren Commission noted that "these additional deficiencies [in security] were related directly to the decision to admit newsmen to the basement." The commission concluded that the pressure of press, radio, and television for information about Oswald's prison transfer resulted in lax security standards for admission to the basement, allowing Ruby to enter and subsequently shoot Oswald, noting that "the acceptance of inadequate press credentials posed a clear avenue for a one-man assault." Oswald's death was said to have been a direct result of "the failure of the police to remove Oswald secretly or control the crowd in the basement." The consequence of Oswald's death, according to the Commission, was that "it was no longer possible to arrive at the complete story of the assassination of John F. Kennedy through normal judicial procedures during the trial of the alleged assassin." While the Commission noted that the prime responsibility was that of the police department, it also recommended the adoption of a new "code of conduct" for news professionals regarding the collecting and presenting of information to the public that would ensure "there [would] be no interference with pending criminal investigations, court proceedings, or the right of individuals to a fair trial." The findings prompted the Secret Service to make numerous modifications to its security procedures. In November 1964, two months after the publication of its 888-page report, the Commission published twenty-six volumes of supporting documents, including the testimony or depositions of 552 witnesses and more than 3,100 exhibits. All of the commission's records were then transferred on November 23 to the National Archives. The unpublished portion of those records was initially sealed for 75 years (to 2039) under a general National Archives policy that applied to all federal investigations by the executive branch of government, a period "intended to serve as protection for innocent persons who could otherwise be damaged because of their relationship with participants in the case." The 75-year rule no longer exists, supplanted by the Freedom of Information Act of 1966 and the JFK Records Act of 1992. By 1992, 98 percent of the Warren Commission records had been released to the public. Six years later, at the conclusion of the Assassination Records Review Board's work, all Warren Commission records, except those records that contained tax return information, were available to the public with redactions. The remaining Kennedy assassination related documents were partly released to the public on October 26, 2017, twenty-five years after the passage of the JFK Records Act. President Donald Trump, as directed by the FBI and the CIA, took action on that date to withhold certain remaining files, delaying the release until April 26, 2018, then on April 26, 2018 took action to further withhold the records "until 2021". CIA Director McCone was "complicit" in a Central Intelligence Agency "benign cover-up" by withholding information from the Warren Commission, according to a report by the CIA Chief Historian David Robarge released to the public in 2014. According to this CIA report, CIA officers had been instructed to give only "passive, reactive, and selective" assistance to the commission, in order to keep the commission focused on "what the Agency believed at the time was the 'best truth' — that Lee Harvey Oswald, for as yet undetermined motives, had acted alone in killing John Kennedy." The CIA was also covering up evidence that the CIA may have been in communication with Oswald before 1963, according to the CIA findings. Also withheld were earlier CIA plots, involving CIA links with the Mafia, to assassinate Cuban president Fidel Castro, which might have been considered to provide a motive to assassinate Kennedy. The report concluded "In the long term, the decision of John McCone and Agency leaders in 1964 not to disclose information about CIA's anti-Castro schemes might have done more to undermine the credibility of the commission than anything else that happened while it was conducting its investigation." Four of the seven members of the commission, Boggs, Cooper, McCloy, and Russell, had serious doubts regarding the conclusions of the commission that the President and Governor Connally were both wounded by the "magic bullet" and regarding the view that Oswald had acted alone. In the years following the release of its report and 26 investigatory evidence volumes in 1964, the Warren Commission has been frequently criticized for some of its methods, important omissions, and conclusions. In 1992, following popular political pressure in the wake of the film JFK, the Assassination Records Review Board (ARRB) was created by the JFK Records Act to collect and preserve the documents relating to the assassination. In a footnote in its final report, the ARRB wrote: "Doubts about the Warren Commission's findings were not restricted to ordinary Americans. Well before 1978, President Johnson, Robert Kennedy, and four of the seven members of the Warren Commission all articulated, if sometimes off the record, some level of skepticism about the Commission's basic findings." 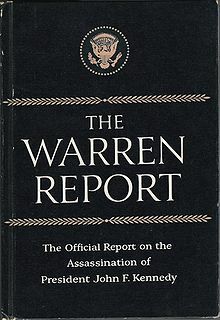 Three other U.S. government investigations have agreed with the Warren Commission's conclusion that two shots struck JFK from the rear: the 1968 panel set by Attorney General Ramsey Clark, the 1975 Rockefeller Commission, and the 1978-79 House Select Committee on Assassinations (HSCA), which reexamined the evidence with the help of the largest forensics panel. The HSCA involved Congressional hearings and ultimately concluded that Oswald assassinated Kennedy, probably as the result of a conspiracy. The HSCA concluded that Oswald fired shots number one, two, and four, and that an unknown assassin fired shot number three (but missed) from near the corner of a picket fence that was above and to President Kennedy's right front on the Dealey Plaza grassy knoll. However, this conclusion has also been criticized, especially for its reliance upon disputed acoustic evidence. The HSCA Final Report in 1979 did agree with the Warren Report's conclusion in 1964 that two bullets caused all of President Kennedy's and Governor Connally's injuries, and that both bullets were fired by Oswald from the sixth floor of the Texas School Book Depository. As part of its investigation, the HSCA also evaluated the performance of the Warren Commission, which included interviews and public testimony from the two surviving Commission members (Ford and McCloy) and various Commission legal counsel staff. The Committee concluded in their final report that the Commission was reasonably thorough and acted in good faith, but failed to adequately address the possibility of conspiracy. In his September 1978 testimony to the HSCA, President Ford defended the Warren Commission's investigation as thorough. Ford stated that knowledge of the assassination plots against Castro may have affected the scope of the Commission's investigation but expressed doubt that it would have altered its finding that Oswald acted alone in assassinating Kennedy. 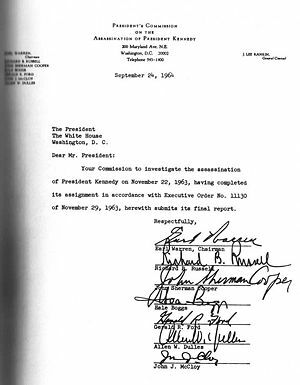 ^ Peters,Gerhard; Woolley, John T. "Lyndon B. Johnson: "Executive Order 11130 – Appointing a Commission To Report Upon the Assassination of President John F. Kennedy," November 29, 1963". The American Presidency Project. University of California – Santa Barbara. ^ Baluch, Jerry T. (November 30, 1963). "Warren Heads into Assassination". Pittsburgh Post-Gazette. Associated Press. p. 1. ^ Lewis, Anthony (September 28, 1964). "Warren Commission Finds Oswald Guilty and Says Assassin and Ruby Acted Alone". The New York Times. p. 1. ^ Morris, John D. (November 30, 1963). "Johnson Names a 7-Man Panel to Investigate Assassination; Chief Warren Heads It". The New York Times. p. 1. ^ a b Beschloss, Michael R. (1997). "Taking charge: the Johnson White House tapes, 1963-1964". New York: Simon & Schuster. ^ a b c d Savage, David G. (May 10, 2012). "Nicholas Katzenbach dies at 90; attorney general under Johnson". Los Angeles Times. Los Angeles. Retrieved December 12, 2014. ^ a b c d "Nicholas Katzenbach, JFK and LBJ aide, dead at 90". Politico. AP. May 9, 2012. Retrieved December 12, 2014. ^ "Warren Commission Meets". Lodi News-Sentinel. Lodi, California. UPI. December 6, 1964. p. 2. Retrieved November 12, 2014. ^ Fixx, James F. (1972). The Great Contemporary Issues: The Mass Media and Politics. New York, NY: Ayer Co. Publishing. pp. 82–83. ISBN 978-0405012914. ^ Belair Jr., Felix (September 28, 1964). "(Warren Commission) Rebukes Secret Service, Asks Revamping". The New York Times. p. 1. ^ Associated Press (September 28, 1964). "Johnson Names 4 to Act on Report". The New York Times. p. 1. ^ Lewis, Anthony (November 24, 1964). "Kennedy Slaying Relived in Detail in Warren Files". The New York Times. p. 1. ^ Final Report of the Assassination Records Review Board (1998), p.2. ^ ARRB Final Report, p. 2. Redacted text includes the names of living intelligence sources, intelligence gathering methods still used today and not commonly known, and purely private matters. 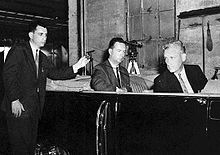 The Kennedy autopsy photographs and X-rays were never part of the Warren Commission records, and were deeded separately to the National Archives by the Kennedy family in 1966 under restricted conditions. ^ "25th JFK Assassination Secrets Scheduled for 2017 Release". Time. Retrieved 2017-03-12. ^ "[U]nless the president certifies that continued postponement is made necessary by an identifiable harm to the military defense, intelligence operations, law enforcement, or conduct of foreign relations, and the identifiable harm is of such gravity that it outweighs the public interest in disclosure." — JFK Records Act. Both the National Archives and the former chairman of the ARRB estimate that 7.6 percent of all identified Kennedy assassination records have been released to the public. The great majority of the unreleased records are from subsequent investigations, including the Rockefeller Commission, the Church Committee, and the House Select Committee on Assassinations. ^ a b Politico, 6 October 2015, "Yes, the CIA Director Was Part of the JFK Assassination Cover-Up: John McCone Was Long Suspected of Withholding Information from The Warren Commission. Now Even The CIA Says He Did," http://www.politico.com/magazine/story/2015/10/jfk-assassination-john-mccone-warren-commission-cia-213197. ^ Philip Shenon (6 October 2015). "Yes, the CIA Director Was Part of the JFK Assassination Cover-Up". Politico Magazine. Retrieved 8 October 2015. ^ David Robarge (September 2013). "DCI John McCone and the Assassination of President John F. Kennedy" (PDF). Studies in Intelligence. CIA. 57 (3): 7–13, 20. C06185413. Retrieved 8 October 2015. ^ a b Assassination Records Review Board (September 30, 1998). "Chapter 1: The Problem of Secrecy and the Solution of the JFK Act". Final Report of the Assassination Records Review Board (pdf). Washington, D.C.: United States Government Printing Office. p. 11. Retrieved June 10, 2015. ^ HSCA Final Report, pp. 41-46. ^ "Findings". archives.gov. 15 August 2016. Retrieved 25 March 2018. ^ a b "Ford defends panel's findings". Lawrence Journal Daily World. 120 (226). Lawrence, Kansas. AP. September 21, 1978. p. 1. Retrieved August 19, 2015. Bugliosi, Vincent (2007). Reclaiming History: The Assassination of President John F. Kennedy. New York, NY: W.W. Norton & Company, Inc. ISBN 978-0-393-04525-3. Wikimedia Commons has media related to Warren Commission. This page was last edited on 19 April 2019, at 07:08 (UTC).